Yemen has experienced wrenching changes that have transformed the country in yet unknown ways. The country exploded in a popular revolution against the long-time rule of Ali Abdallah Saleh. While the country appeared to slip toward civil war, Yemeni political elite rallied with international backers to put together a transitional government with a plan to revise the country's constitution. The transitional government began with a cautious sense of optimism and the prospect of substantial change for the better, but ended in collapse because of a failure to govern. The politics of the street overran an ineffective transitional government that could not address the urgent concerns of Yemeni citizens for security and jobs. Instead, populist leaders exploited people's dissatisfactions and threw the country into civil war. The Houthi organization covertly allied with its former enemy, Ali Abdallah Saleh, to overthrow the transitional government and declare war on the rest of the country. Saleh seems unable to conceive of life outside of the Presidential Palace and his Houthi allies appear to believe they are destined to rule. Unfortunately, those opposed to Saleh and the Houthi also seem unable to provide effective rule in spite of massive backing from the Gulf States. The incompetence, infighting, and incoherence of the Hadi government bode equally ill for the future of the country. The one hope may be that a new generation of Yemeni leaders emerges to displace the dismal failures of this one. This third edition of Historical Dictionary of Yemen contains a chronology, an introduction, appendixes, and an extensive bibliography. The dictionary section has over 1000 cross-referenced entries on important personalities, politics, economy, foreign relations, religion, and culture. 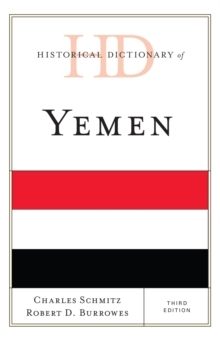 This book is an excellent resource for students, researchers, and anyone wanting to know more about Yemen.